Green and Blue Infrastructure (GBI) is a network designed and planned to deliver awide range of ecosystem services and to protect biodiversity. Existing GBI designs lacked a systematic method to allocate restoration zones. 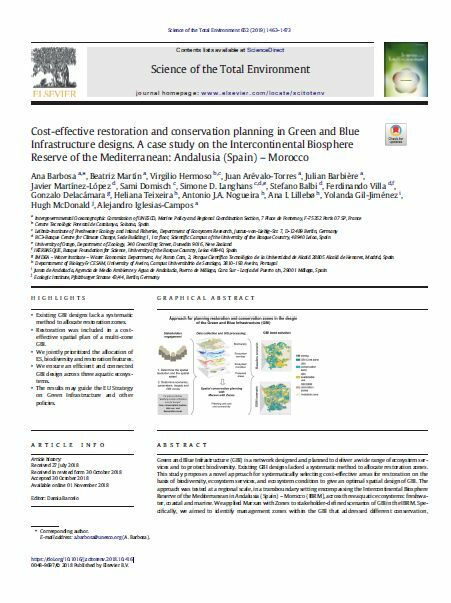 This study proposes a novel approach for systematically selecting cost-effective areas for restoration on the basis of biodiversity, ecosystem services, and ecosystem condition to give an optimal spatial design of GBI. Ecologic Institute's Hugh McDonald contributed to this article. The approach was tested at a regional scale, in a transboundary setting encompassing the Intercontinental Biosphere Reserve of the Mediterranean in Andalusia (Spain) –Morocco (IBRM), across three aquatic ecosystems: freshwater, coastal and marine. We appliedMarxanwith Zones to stakeholder-defined scenarios of GBI in the IBRM. Specifically, we aimed to identify management zones within the GBl that addressed different conservation, restoration and exploitation objectives. Although almost all conservation targets were achieved, our results highlighted that the proportion of conservation features (i.e., biodiversity, ecosystem services) that would be compromised in the GBl, and the proportion of provisioning services that would be lost due to conservation (i.e., incidental representation) are potentially large, indicating that the probability of conflicts between conservation and exploitation goals in the area is high. The implementation of restoration zones improved connectivity across the GBI, and also achieved European and global policy targets. Our approach may help guide future applications of GBI to implement the flexible conservation management that aquatic environments require, considering many areas at different spatial scales, across multiple ecosystems, and in transboundary contexts. Barbosa, Ana et. al. 2018: Cost-effective restoration and conservation planning in Green and Blue Infrastructure designs. A case study on the Intercontinental Biosphere Reserve of the Mediterranean: Andalusia (Spain) – Morocco. In: Science of the Total Environment, 652 (2019), 1463–1473.